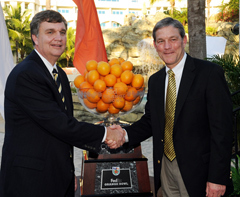 Coach Johnson, Coach Ferentz at an event prior to the Orange Bowl. The Iowa Hawkeyes will be in search of their biggest victory since 1959 when they take on Georgia Tech in the 76th Orange Bowl in Miami. The Hawkeyes enter the game with a mark of 10-2 and meet a Tech squad that is 11-2 after winning the ACC title. The chore for the Iowa defense will be to slow down a Georgia Tech option attack that is unlike anything the Hawks have gone up against this season. Linebacker Pat Angerer says the line is fast and physical and they cut the defenders on every play. Quarterback Josh Nesbitt and runningback Jonathan Dwyer lead an offense that is averaging more than 300 yards on the ground and nearly 35 points per game. Defending the option begins with the defensive ends. Junior defensive end Adrian Clayborn says they option off the end, so he has to do his job right. He says they have to be assignment sound and not get out of position. Clayborn says they can’t try to make the plays they can’t make. Georgia Tech does not throw it much but when they do it can result in a big play. Iowa safety Brett Greenwood says they have to be aware of the pass as Georgia Tech will run and run and then pull back and pass it. Quarterback Ricky Stanzi says it will be up to the Iowa offense to help keep the Georgia Tech offense off the field. He says they will have to execute at a high level when they are playing against a team that can move the ball on offense and eat up the clock. Stanzi says time possession could be an important part of the game. The Iowa offensive line must find a way to block All-American defensive end Derrick Morgan who had 12 and a half sacks during the regular season. Iowa center Rafael Eubanks says he plays on both side of the ball and try to put him in a position to make plays. Iowa’s last win in a major bowl game was back in the 1959 Rose Bowl. Iowa coach Kirk Ferentz says the Hawks have had an outstanding season and would love to finish it with a win. Ferentz says they come in confident, but respectful, knowing they face a great football team and are the underdogs. The Hawkeyes have been involved in a number of close, hard-fought games this season and Ferentz expects the Orange Bowl to be no different. He says if you play in January in a BCS game that’s the way it’s going to be, and he says they’ve face those challenges all year and he is anxious to see how they handle it. Ferentz says the Hawks must find a way to slow down Tech defensive end Derrick Morgan. He says it’s like playing their offense, and he is in there on every play. Ferentz says when the ball is in Iowa territory the Hawkeye defense needs to be ready to play all four downs because the Yellow Jackets are likely to go for it. He says their fourth down attempts are double what the opponents have done. Ferentz says time of possession could be a big factor in the outcome, as he says the first thing that jump out at the offense is the typical amount of plays the opponents have is in the 50’s, which is a low number. He says you have to maximize each possession. Georgia Tech coach Paul Johnson says they expected Ricky Stanzi to be back for the Hawks. He says they usually get ready for the system and don’t focus a lot on individual players, as he says Iowa won’t change a lot based on who is playing quarterback. Johnson says winning so many close games have made Iowa a confident team. “I think they probably believe they are going to win, most good teams do,” Johnson says. Johnson says the Yellow Jackets pass defense will need to be strong. That unit was exploited in a number of games during the regular season.